The greatest gift is a passion for reading. It is cheap, it consoles, it distracts, it excites, it gives you knowledge of the world and experience of a wide kind. It is a moral illumination. ~ Elizabeth Hardwick. Listening to music is a favorite pastime for many of us, but the average teen or young adult spends way too much time boppin' to their iPods rather than getting wrapped up in a good book. Case in point: A few days ago I went to the hair salon to get my hair done. This ordeal takes anywhere between 2-3 hrs so I decided to take a book with me. What better way is there to spend 2hrs under a hot dryer than with a good ole Robin Cook book, or something? I also brought my iPod with me, and somewhere between trying to block out the Novelas (Spanish soap operas) on the flat screen in front of me and wanting so badly to listen to Toni Braxton's new album, I succumbed to the iPod. Needless to say, Robin Cook was never cracked - FOR 2 WHOLE HOURS. Interestingly, as I left the salon I said to myself, If only iPods were books, this world would be full of scholars! or at least my generation would be more academically advanced. see http://www.tipb.com/2009/03/03/kindle-iphone-ipod-touch-itunes-app-store/. 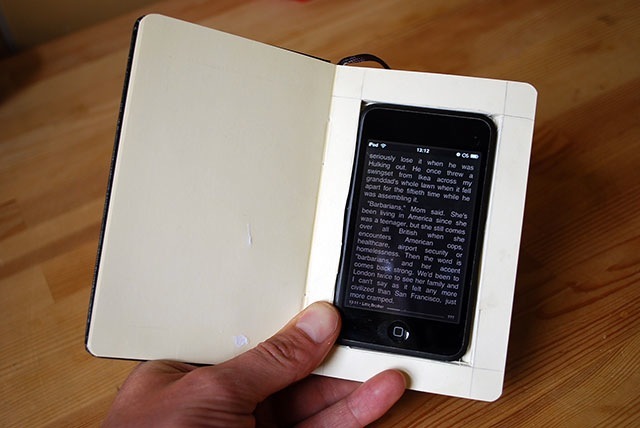 i have been using the iphone as a book for the last few weeks. it's wonderful! try it. be well. I know of it. I don't own an iPhone and I find it cumbersome to read on such a small screen. But for those who can, it sure sounds like a good idea.